Page 5 SPACEPORT NEWS March 19, 1999 Lola Rodriguez De Tio High School, Laura Mercado High School and San German InterAmerican High School). Among other Florida teams competing were Astronaut High and Titusville High schools (the ComBBat Team), Rockledge, Cocoa Beach and Merritt Island High schools (the Space Coast FIRST Team) and Satellite Beach High School (the Scorp Squad). A party was held for the teams on Friday evening, March 5, in KSCs Apollo/Saturn V Center, where students dined on hot dogs, hamburgers and bratwurst dancing the night away and forging new friendships. Placing in the top eight alliances were 10 Florida teams, including the Space Coast FIRST Team. The ComBBAt Team was given the Johnson & Johnson Best Sportsmanship Award and the Space Coast FIRST Team the Rookie All Star Award. Awards presented to other Florida teams were Best Play of the Day (Aventura), Judges Award for Perseverance (North Miami Beach), Motorola Quality (St. Petersburg), Featherweight in the Finals (Aventura), Outstanding Defense Round (Clearwater), Best Offensive Round (Ocoee), Human Action Respect and Teamwork (St. Petersburg) and Finalist (Ocoee). DaimlerChrysler Team Spirit, Xerox Creativity, Honeywell Leadership in Control and #1 Seed were other awards presented. Two local teams (the ComBBat and Scorp teams) plan to participate in another FIRST competition, the Great Lakes Regional, to be held in Detroit March 25-27. The ComBBat and Space Coast teams also will be participating in a national FIRST competition to be held at EPCOT Center, Disney World, April 22-24. Center Director Roy Bridges encouraged students to continue their interest in engineering and told them he hoped they would be back at KSC in five years as part of the KSC team planning the mission to Mars. Judges for the matches included Deputy Director for Launch and Payload Processing Loren Shriver, former KSC Director of Shuttle Processing Robert Sieck, KSC retiree Katherine Harer and Superintendent of Brevard County Schools David Sawyer. Volunteers served as referees. Volunteers handled crowd control, field repair, machine shop staff, referees, scoring, helping in the pit area and numerous other duties, said Carol Cavanaugh, a NASA representative on the KSC Planning Committee for the event. To make this event a success required a team effort of many volunteers, and we could not have done it without them. The KSC Planning Committee for the FIRST event included both NASA and contractorAt left, the competition continues as judges (far right) confer about the teams to take awards in this match of engineering intellect. Below, jubilant in a victory, one team leaps for joy watching the action on the playing field.employees. Representing NASA on the committee were Carol Cavanaugh, Lisa Fowler, Bennie Bell, Pat Caroleo and Eduardo Lopez del Castillo. Boeing representatives included Mike Sklar, Matt Atkinson and Brenda Bell. SGS was represented by Jim Thornton, and Delaware North Parks Services participants were Charlene Walters and Debbie Land. Also attending the event was Astronaut David Brown, who visited the pit area to meet all of the teams competing and autographed robots, t-shirts and frisbees.At right, KSC Director of Engineering Development Sterling Walker (left) and Center Director Roy Bridges (right) give high fives to the competitors after the FIRST event held at KSC. Below, high fives and handshakes are the order of the day as happy contestants, judges and event participants congratulate students on a job well done. This was the first southeast regional event held by FIRST, and the first time that KSC has hosted the event. NASA has participated by providing support in the past. 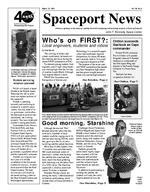 Page 6SPACEPORT NEWSMarch 19, 1999 Mark your calendars for Thursday, March 25, when the Society of Women Engineers will be celebrating Womens History Month at the Jamaica Room, Radisson Resort in Cape Canaveral. Commencing at 6:30 p.m., a formal dinner will be held, along with a panel session of special guests, including Diana MacArthur, chief executive officer of Dynamac Corporation; Marion Almy, founder of Archeological Consultants, Inc.; and Dr. Irma BecerraFernndez, assistant professor of the Decision Sciences and Information Systems Department at the College of Business at Florida International University. These women will share anecdotes, words of wisdom and stories of their professional lives and businesses. The purpose of this formal dinner during Womens History Month is to celebrate womens Womens History Month dinner approaches Two representatives from KSCs Logistics Operations Directorate recently participated in the Florida Solar Energy Centers (FSEC) national alternative fuel vehicle rally, the SunDay Challenge. They went to help increase public awareness of KSC and NASA programs in environmental and technical leadership. The seventh annual event was held Feb. 19 and 20 at the FSEC in Cocoa. More than 50 vehicles participated, representing universities, colleges, high schools, businesses and individuals from around the country. NASA at KSC, the Melbourne Police Department and the Orlando Utilities Commission were the only participants from government. The two vehicles that KSC entered the Hytest Ranger and a compressed natural gas (CNG)-powered vehicle took first and second place, respectively, in their class. LogisticsEnvironmental leadership a driving force at KSCEnvironmental Coordinator Eric Dirschka, driving the Hytest Ranger, was the only participant to complete the event at exactly the determined time. The Hytest Ranger runs on a clean burning blend of natural gas and hydrogen. As the name implies, the event is focused on Alternative Fuel Vehicles (AFVs). AFVs are vehicles powered by fuels other than gasoline or diesel. The fuels used by the vehicles at the rally included electricity, CNG, propane, hydrogen and soybean oil. AFVs produce less emissions than conventional vehicles and they help reduce our countrys dependence upon foreign oil. For these reasons, the federal government has mandated their expanded use through legislation such as the Energy Policy Act of 1992, which requires that 75 percent of federal fleet new vehicle purchases be AFVs. State and local government fleets, as well as certain private fleets, also have AFV use requirements. The General Services Administration (GSA), from whom KSC leases its vehicles, has made significant contributions to KSCs position as the agency leader in AFV use. For example, they have managed to obtain additional CNG-powered vehicles from installations without refueling capability. The KSC fleet now includes more than 200 AFVs and even a CNG -powered bus, which provided transpor-This Formula Lightning class car is considered a high performance electric vehicle. The General Motors EV1 pace car leads the lineup for the SunDay Challenge rally. Third in line is the KSC Hytest Ranger and fifth is the crowd-pleasing Corvette fueled with soybean oil.tation for SunDay Challenge spectators. The vehicles in this rally demonstrated that AFVs are no longer the slow-running jalopies of the 1970s. In fact, vehicles such as a 200 horsepower sport coupe, 120+ mph Indy style racers and a soybean oil-burning Corvette were among the participants. accomplishments and advances in science, engineering, business, education, government and many other areas. For only $20, you can participate in this dinner during Womens History Month. For reservations, call Brenda Fuentes at 867-1185. Corporate tables of 10 seats are also available. Run for your life! You can help celebrate the opening of KSCs new and expanded Fitness Center by participating in KSCs first Fired Up Relay on Tuesday, March 23 at 5 p.m. Although the Grand Opening and ribbon cutting of the new fitness center in room 1108 of the Operations and Checkout Building (O&C) Building has been postponed from its previously announced March 24 date, the race will still be held March 23 in front of the O&C Building. The new Grand Opening is now planned for late April or early May. The Grand Opening and ribbon cutting event will include games and kick-off festivities, and celebrities are scheduled to attend the opening of the facility. Once scheduled, the new date will be announced in Spaceport News and Countdown You may register to participate in the race by contacting the Fitness Center at 867-7829. March 19, 1999SPACEPORT NEWSPage 7 March employees of the monthMarch employees of the month include, left to right, Scott Huzar, Shuttle Processing; Tom Elam, Logistics Operations, Chuck Tatro, ELV and Payload Carriers Program; James Lichtenthal, Business Innovation Group; Louise Boyd, Administration Office; Christopher Forney, Engineering Development; Christy Moore, Public Affairs Office; Michael Steven, Installation Operations; Debbie Hurlburt, Office of the Chief Financial Officer; William Merrill, Checkout and Launch Control System Office; and Vincent Carrubba, Safety and Mission Assurance. Not shown are Kenneth Newton, Joint Performance Management Office; Schonda Rodriguez, Space Station and Shuttle Payloads; and Jay Gurecki, Space Station Hardware Integration Office. This years KSC All-American Picnic is scheduled for Saturday, April 10, from 10 a.m. to 4 p.m. at KARS Park I. Center Director Roy Bridges (third from left) bought the first ticket to the event from (left to right) USA Picnic Co-Chairperson Jim Furr, NASA Ticket Committee Co-Chairperson Launa Maier and NASA Picnic Co-Chairperson Harry Silipo. The picnic is co-sponsored by NASAs Shuttle Processing Directorate and United Space Alliance. Tickets are on sale at NASA Exchange stores. Tickets are $4 for adults and $3 for children. Tickets purchased the day of the event will cost an additional $1. One hot ticket now on sale: the KSC All-American PicnicChilton ...(Continued from Page 1) Brig. Gen. Randall StarbuckExpeditionary Forces Management Team, Headquarters Air Combat Command, Langley Air Force Base, Va. As 45th Space Wing commander, Chilton will oversee the preparation and launching of U.S. government and commercial satellites from Cape Canaveral Air Station, granting final approval authority for all launches on the Eastern Range. Previously, he was deputy director of operations, Headquarters Air Force Space Command, Peterson Air Force Base, Colo. Chilton, a colonel in the U.S. Air Force and now brigadier general (select), is a veteran of three space flights, logging more than 704 hours in space. He was the pilot on both STS-49 and -59 and the commander on STS-76. Chilton received his Air Force commission from the U.S. Air Force Academy in 1976 and then completed a masters degree in mechanical engineering on a Guggenheim Fellowship at Columbia University in 1977. In 1978, he received his wings at Williams Air Force Base, Ariz.,and from 1978 through 1981, he served as a combat-ready pilot, instructor pilot and a squadron pilot. In 1982, Chilton attended the U.S. Air Force Squadron Officer School at Maxwell Air Force Base, Ala., and finished as the number one graduate for the year, receiving the Secretary of the Air Force Leadership Award. In 1984, he was selected for the USAF Test Pilot School and also graduated number one in his class. He was then assigned to Eglin Air Force Base, Fla., where he conducted weapons and systems tests in all models of the F-15 and F-4. He was selected as an astronaut candidate in 1987. Brigadier General Starbuck entered the Air Force in 1972 as a distinguished graduate of Southwest Texas State Universitys Reserve Officer Training Corps program. He has flown C-141 missions around the world in a number of contingencies and has commanded a flying training operations group. Prior to his assignment at Cape Canaveral, he was chief of operations, Headquarters 14th Air Force, Vandenberg Air Force Base, Calif. A change-of-command ceremony is expected to occur in mid-May. The 1999 KSC All American Picnic is shaping up to be a great day for KSC employees, their families and friends. The picnic will be held April 10 from 10 a.m. to 4 p.m. at KARS Park I. Tickets are now on sale in all KSC NASA Exchange stores and cost $4 for adults (ages 13 and up) and $3 for children (ages 3 to 12). Children under the age of 3 are not required to have a ticket. There will be a Childrens Carnival at the picnic, and the KSC Spaceman will be available for photos. Eight ponies will be at the carnival, along with putt-putt golf, a model rocket launch demonstration, a 1938 model fire truck with faithful Dalmation dog, clowns, a train ride, carousel, kiddy swings and more. Family sports will feature Golf Closest to the Pin; Basketball Free Throw and 3 Point Shot Contests; Street Hockey Shootout; Horseshoes; Bingo, and Adult-Child Team Relay Races; as well as pickup games in volleyball, softball and putt-putt golf. There will be a Kids Fishing Tournament (with prizes!) for children 14 and under. Kids must be in the company of an adult, 18 or older. You can register your team now on the Picnic Web Site at http://www.ksc.nasa.gov/events/ 1999/picnic/ A wildlife encounter featuring Thunderhawk Big Cat Rescue, a native American group dedicated to the preservation of the great cats, will be at the picnic again this year. Show times are 11 a.m., 1 p.m. and 2:30 p.m. An All-American Cultural Cuisine Cook-Off will be held, in which participants will prepare a dish from any culture or geographic area of their choice. To sign up, contact Rick English at 867-2126. For automobile and gas engine enthusiasts, a Car & Antique Engine exhibition will be held. Antique, stock, street rods, custom cars and antique gas engines will be featured. The meal, catered by Sonnys Real Pit Bar-B-Q, will consist of a BBQ Pork Sandwich, baked beans and cole slaw; the childrens menu will include a hamburger or hot dog, potato chips and a cookie. Volunteers are needed to help out in all areas. If you are willing to help out for even an hour or two, please contact Cindy Coddington at 867-3758 or Wanda Redmond at 861-3510. Details and rules for all events can be found on KSCs All American Picnic Web Site and more information will be provided in the next issue of Spaceport News . John F. Kennedy Space Center Managing editor. . . . . . . . . . . . . . . . . Bruce Buckingham Editor. . . . . . . . . . . . . . . . . . . . . . . Susan Maurer Editorial support provided by Information Dynamics Inc. Writers Group. NASA at KSC is on the Internet at http://www.ksc.nasa.gov USGPO: 733-112/80027Spaceport News Spaceport News is an official publication of the Kennedy Space Center and is published on alternate Fridays by the Public Affairs Office in the interest of KSC civil service and contractor employees. Contributions are welcome and should be submitted two weeks before publication to the Media Services Branch, AB-F1. E-mail submissions can be sent to Susan.Maurer-1@ksc.nasa.gov SPACEPORT NEWSMarch 19, 1999 Page 8 Throughout March, you may see bulldozers and tractors chopping and cutting shrubs and tall trees in areas by KSCs north gate to restore the habitat required by the Florida scrub jay (seen above). The scrub habitat has become overgrown, losing its value for scrub-dependent plants and animals and presenting conditions that can change the habitat. Tall trees, for example, provide perches for predators that threaten the scrub jays. After the chopping and cutting, when conditions are favorable, the Merritt Island Wildlife Refuges fire specialist will burn the 1,500-acre area to create natural openings and reduce the overall height of the scrub. Determined not to be scrubbed The X-38, a technology demonstrator for the proposed emergency crew return vehicle for the International Space Station, passed a major milestone March 5 with a successful unpiloted flight test. The first X-38 atmospheric test vehicle (seen above) was dropped from under the wing of NASAs B-52 aircraft at the Dryden Flight Research Center, at Edwards Air Force Base, Calif., at 11:30 a.m. EST and completed a descent from a 23,000-foot altitude at 11:38 a.m. The test focused on the use of the X-38s parafoil parachute, which deployed as planned within seconds after the vehicles release from the B-52. Atmospheric drop tests of the X-38 will continue for the next two years using three increasingly complex test vehicles. The tests will increase in altitude to a height of 50,000 feet and include longer flight times for the test craft prior to deployment of the parafoil. In the year 2000, an unpiloted space test vehicle is planned to be deployed from a Space Shuttle and descend to a landing. The X-38 crew return vehicle is X marks the spot for a perfect landingThe X-38 lands safely near the Dryden Flight Research Center, Edwards, Calif., on March 5.targeted to begin operations aboard the International Space Station (ISS) in 2003. Once operational, the X-38 will become the first new human spacecraft designed to return humans from orbit in more than 20 years. Although the primary application of the new spacecraft would be as an International Space Station lifeboat, the project also aims at developing a design that could be easily modified for other uses, such as a possible joint U.S. and international human spacecraft that could be launched on expendable rockets as well as the Space Shuttle. The X-38 takes advantage of already-developed technology for as much as 80 percent of the spacecrafts design, such as a lifting body concept originally developed by the Air Force X-24A project in the mid-1970s. In the early years of the ISS, a Russian Soyuz spacecraft will be attached to the station as a crew return vehicle, but as the size of the station crew increases, a vehicle like the X-38 will be able to accommodate up to seven passengers. After delivering a French satellite for the EUTELSat Consortium, a Russian cargo plane, the Antonov 124, sits on the end of the Shuttle Landing Facility at KSC. The plane arrived at KSC last week. The satellite is targeted to be launched April 12 aboard an Atlas IIAS rocket from Complex 36, Cape Canaveral Air Station.